Seed quality is a major issue for crop establishment especially in low input farming systems, where varieties often grow under more stressful conditions than in conventional farming systems. Corn (Zea mays L.) seed for organic (low input) production will eventually need to be grown organically, thus research is needed to ensure excellent seed quality in organic corn seed production. The objective of this study was to compare seed quality and composition differences between a group of high protein corn genotypes grown under low input and conventional farming systems, and to compare the relative seed quality of these genotypes to two well known inbreds, B73 or Mo17. Twenty high protein breeding genotypes were planted during two growing seasons in conventional and organic nurseries near Ames, Iowa, to produce seeds for laboratory tests. The germination, saturated cold, accelerated aging, and soak test percentages of seeds produced organically were 5 to 11% lower than for seeds produced conventionally. Protein, measured by near-infrared reflectance, was unaffected by the production location, but the oil content of seeds produced organically was significantly higher (between 0.2 and 0.3% higher) than in the conventional system. Location by genotype interactions for most tests were non significant both years, indicating that genotypes selected for high seed quality in a conventional system will also have high seed quality when grown in a low input, organic system. This article is published as De Geus, Yara N., A. Susana Goggi, and Linda M. Pollak. 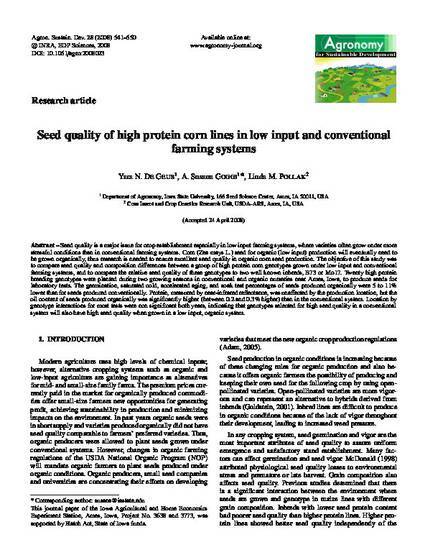 "Seed quality of high protein corn lines in low input and conventional farming systems." Agronomy for sustainable development 28, no. 4 (2008): 541-550. doi: 10.1051/agro:2008023.